When we arrived around 8:30 for dinner the only mains that weren't 86'd already were a Roasted Pork Chop with Cheddar Cheese, Potatoes and Salad, and a Caponata with Fried Egg and Salad. We weren't sure what caponata was but we ordered one of each and also a Chicken Liver Pate with Toast to start. The pate was delicious. It came cold with a pile of little gherkins and we only wished there was more bread. We cleared the plates of both of the mains -- my pork chops were cooked perfectly with a mustardy sauce and potatoes au gratin. The Caponata turned out to be a vegetarian dish of a sort of eggplant and tomato stew that Charlie enjoyed -- it was nicely done but I'm less than enthusiastic about eggplant. The bill was reasonable and we were stuffed and happy. The Charles Lamb remains a favorite. 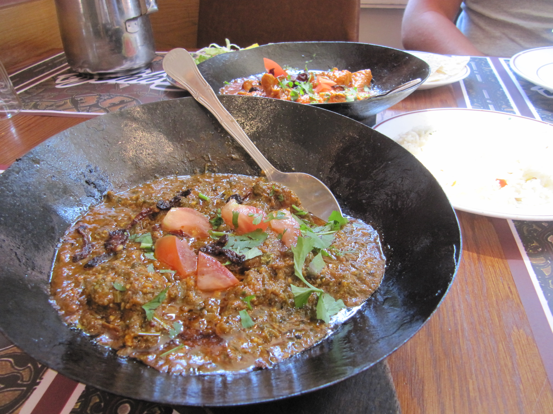 Tayyabs: Tayyabs is a curry house in East London serving Pakistani Punjabi food. 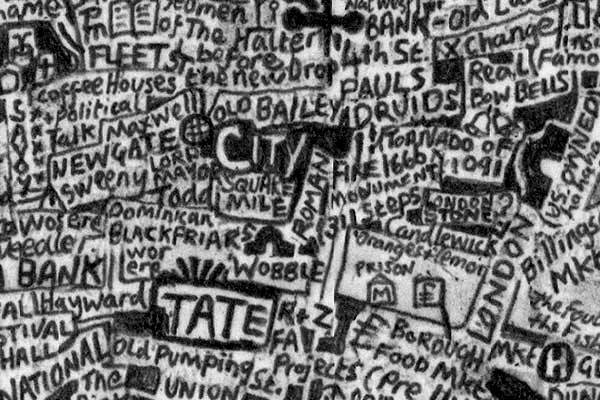 We had heard great things and Charlie had been once before, so we ditched the crowds of Brick Lane and headed there for lunch before hitting the Whitechapel Gallery. We ordered a small Karahi Chicken, small Meat Saag, and a Garlic Naan. We were served poppadoms without asking for them; we later found them on the bill for 1 pound 20p. Cheeky. The curries were delicious; they were heavily seasoned and not super heavy or thick. Both had a good spice to them. I definitely preferred the saag which is made of a spinach base. The naan was good but nowhere close to as good as the garlic naan I had in Laos. Anyway, Tayyabs was great and cheap and I would definitely recommend it to anyone looking for an authentic curry in London. Byron: Byron is a run-down hipster looking building on Upper St. in Islington. 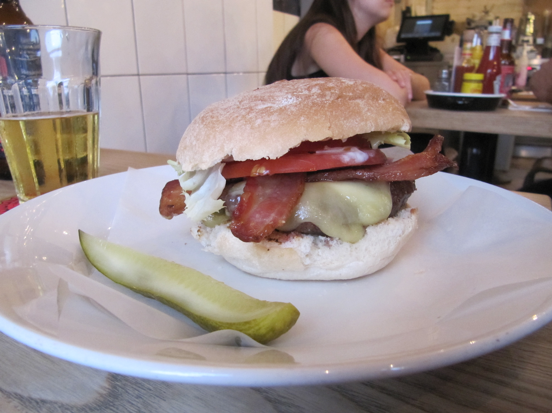 We've always looked at it from afar and been interested in the alluring promise of gourmet burgers lurking behind its doors. We went with Charlie's sister and sat upstairs beneath the exposed skeleton of the building and crumbling paint on the walls. We each ordered a burger and got two sides of fries and one of mac and cheese. The food was good but the service lacked a bit. Trullo: Trullo would get stars from Sam Sifton. This newish Italian restaurant near the Highbury and Islington tube has been bustling since it opened but Charlie and I were finally able to get a reservation for this past week. We excitedly each ordered a starter and a main -- Charlie had the Pappardelle with Beef Shin Ragu and the Skate with Slow Cooked Yellow and Green Courgettes and Brown Shrimp. I had Deep Fried Rabbit with Aioli and Crispy Polenta with Taleggio, Spinach and San Marzano Tomato Sauce. Everything was amazing. The beef shin ragu was unreal; it was creamy and salty and sweet. The meat was shredded and the perfectly al dente pasta was topped with grated parmesan. Off to a great start. My rabbit was quite bony but the meat was nice tasting and the aioli was great -- it was my first rabbit experience and I was taken aback by the bones but it was worth a try. Both of our mains were exceptional. The textures of the tomatoes and spinach went so well with the creamy polenta; it melted in my mouth. I want it again now. We shared a caramel panna cotta for dessert and then died and went to heaven. The service was good and the ambiance was nice. The prices are a bit high but so worth it. GO TO TRULLO EVERY DAY.